Gardening season is kicking into gear here in Amherst, MA. This year I am planning to add swamp milkweed (Asclepias incarnata) and amsonia (Amsonia spp.) to my fiber and dyeplant garden at Bramble Hill Farm. I got the swamp milkweed seeds from my sister, Simone, from a plant near her apartment. You can see a photo of some cordage I made from it in an earlier blog post here. These last two posts are very belated, so a reader may have totally forgotten that the weld and cosmos baths I’m talking about were left over from my workshop at the annual spring conference of Mass.Ag. in the Classroom back on March 8th. After those intense, vivid colors on 40/2 linen yarns from the first and second weld exhaust baths, I assumed there was still quite a bit of color left in the bath. I thought it would be fun to try a couple experiments. 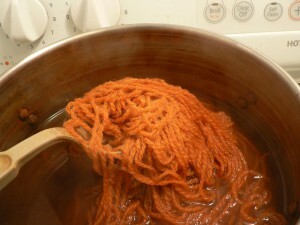 My first experiment was to put a mordanted cotton-linen blend skein in the weld bath overnight, but not to heat it at all.